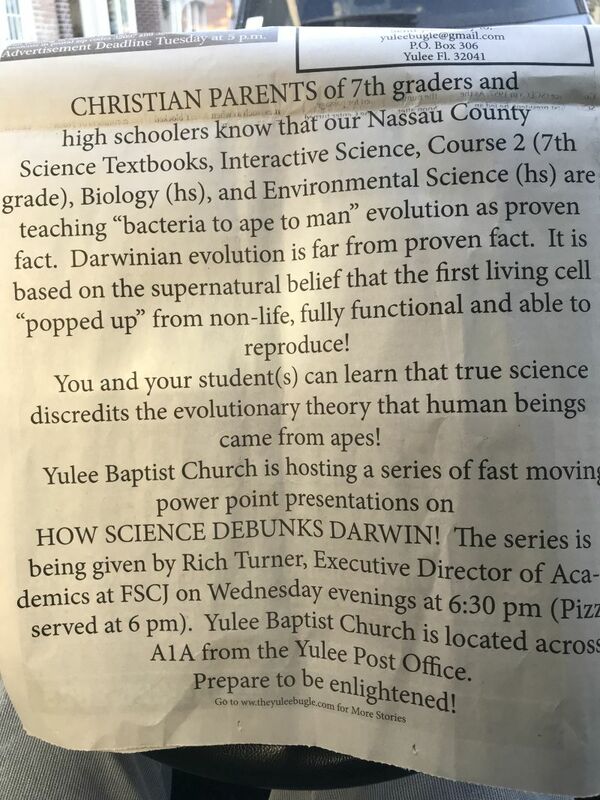 Nassau County: How Science Debunks Darwin! We need to keep an eye on the shenanigans in Nassau County. Some folks there are very riled up about evolution lessons in the district’s middle and high schools. A citizen had filed a formal complaint a couple of months ago and proposed that disclaimer stickers be placed in all of the biology textbooks. We learned that school officials are sympathetic to the creationists but turned down the disclaimer sticker idea. However, I can easily picture the school board approving a more subdued anti-evolution idea in the future and it’s clear the locals aren’t defeated by any means. For instance, this notice appeared in the small town newspaper The Yulee Bugle. These church-hosted creationist seminars happen all the time across the state and the country. I rarely bother to mention them here. But this one is worth featuring because of the recent complaint about textbooks to the school board, the likelihood that the school board is sympathetic to creationists, and the direct mention of textbooks in this ad. I very much appreciate you bringing this to my attention for I was unaware of this, as was Mr. Turner’s supervisor, the College Provost. While the College is an open access institution that remains neutral and welcoming to everyone regardless of preference, these events are unrelated to FSCJ and Mr. Turner’s employment. I have asked the Provost to work with Mr. Turner to engage his understanding that the College cannot be affiliated with this and to immediately correct the flyer with the removal of any connection to FSCJ. My sincere thanks to my contact for keeping us informed and taking action. And if you’re interested, you can watch Mr. Turner give one of his creationism presentations here. One Response to Nassau County: How Science Debunks Darwin! Hey, with the arguable exception of “PowerPoint”, they spelled everything right – with only a couple of punctuation errors. Their version of science fails all the way around, but at least there isn’t much of it here. Better than I would have predicted – maybe the Yulee Bugle editors helped ’em out.